A very disappointing end to the month with just two Grey Plovers passing west and 12 Mediterranean Gulls at the Patch being about the only birds of note. Only one Willow Warbler was seen bringing the months total to a miserable nine birds. 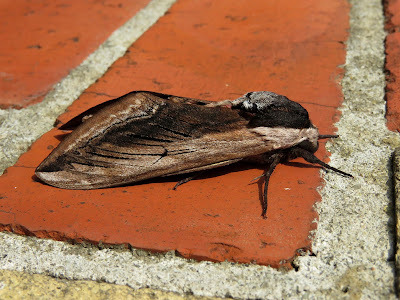 The moth traps were also quiet but two Hummingbird Hawk-moths were seen during the day. With a strong southerly wind blowing and occasional showers the sea provided most of the interest. Coverage was almost dawn to dusk but with many observers exact numbers have been very difficult to assess but the following totals were of note; 29 Balearic Shearwaters, 49 Manx Shearwaters, five Sooty Shearwaters, well over 1000 Gannets, two Great Skuas, 182 Common Terns and a Little Tern all flew west. The clear highlight of the day though was a single Great Shearwater seen by one observer as it flew slowly west past the fishing boats at 1417hrs. 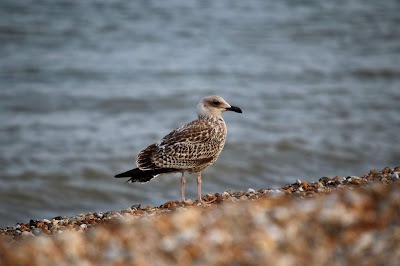 Four Yellow-legged Gulls were also seen on the beach. Around 360 Swifts also flew south. 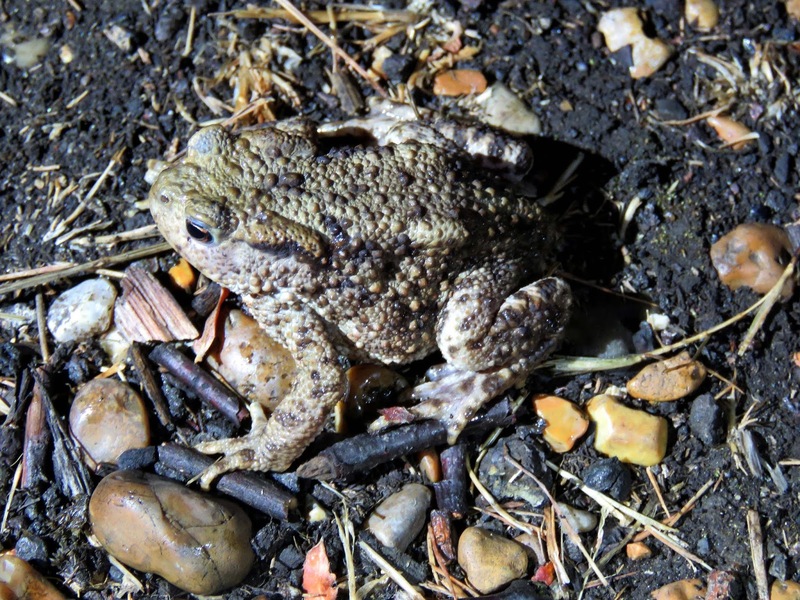 Four Porpoise and two Grey Seals were feeding offshore and a Brown Hare was seen near the railway station. Another very unusual sighting this morning was a breaching Thresher Shark. 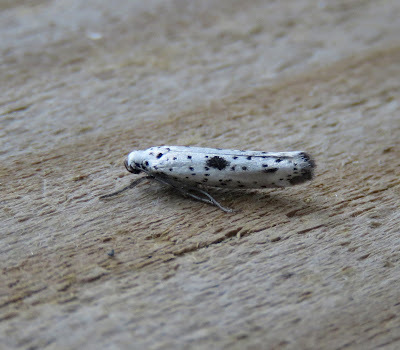 A cooler and very windy day restricted observations on the land but 170 Swifts and two Sand Martins passed through. Despite the rough conditions the sea was generally quiet although a Balearic Shearwater flew east and 60 Mediterranean Gulls were seen. One Porpoise was feeding offshore. 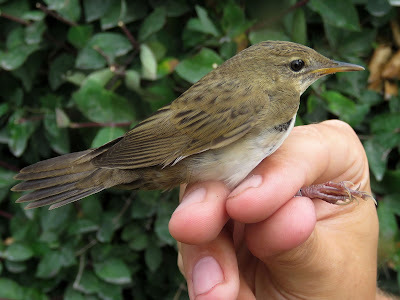 The trickle of migrants continues with singles of Willow Warbler, Garden Warbler, Sedge Warbler and Song Thrush among the birds trapped and two Green Sandpipers passing overhead. After yesterdays feeding frenzy of Mediterranean Gulls only six were seen today. A Grey Seal and five Porpoises were feeding offshore. 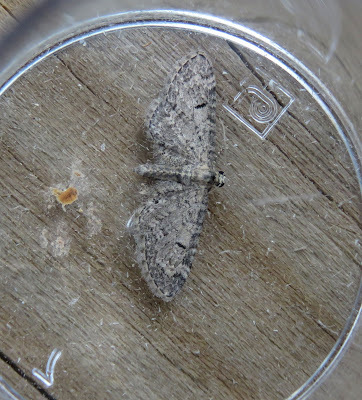 Moth trapping produced an Yponomeuta plumbella (which appears to be new for the trap), an Oak Hook-tip and our sixth record of Channel island Pug. Typically, the much talked about Lunar Eclipse was missed with the arrival of perfectly timed violent thunderstorms from about 1900. Virtually the first clouds there have been in the skies for what seems like weeks. Another cloudless, very hot and calm day with just a trickle of migrants passing through including a Buzzard, three Whimbrels, three Redshanks, three Willow Warblers, a Garden Warbler and two Yellow Wagtails. In mid-morning there was a massive hatch of flying ants and gulls swarmed in to feed on them and included an excellent total of 70 Mediterranean Gull and 400 Swifts also joined the throng. At least five Porpoises and singles of Grey and Common Seal were feeding offshore. 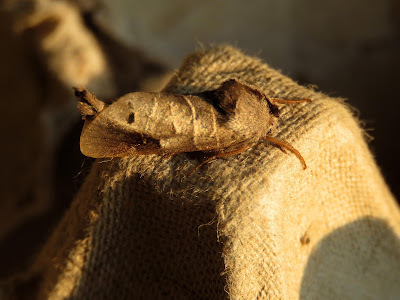 Moth trapping produced the scarce pyralid Euzophera pinguis and a True Lover's-knot while a late evening visit to the trapping area revealed large numbers of singing Tree Crickets and three late-stage nymph Sickle-bearing Bush-crickets. Four female Wasp Spiders were found in their webs in the grassy area in front of the Observatory. A Yellow Wagtail and a handful of Sand Martins passed through while at least 25 Mediterranean Gulls were feeding at the Patch. At least five Grey Seals and a Common Seal were feeding offshore and a Terrapin species was seen in the Southern Long Pit. 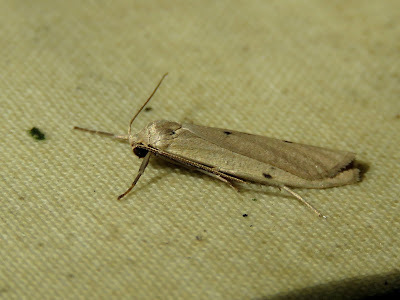 There were plenty of moth-traps overnight but not much in the way of uncommon stuff with a Clay Triple-lines and a Starwort being about the best on offer. Two Whimbrel and a Green Sandpiper flew over this morning and a Mediterranean Gull was seen at the Patch.A Grey Wagtail also flew over and a young Sedge Warbler was trapped. An excellent catch of moths overnight included Clay Triple-lines, Rosy Footman, Coxcomb Prominent, Coronet and Small Rufous and a new micro-moth for the Observatory of a presumed immigrant example of Ethmia quadrilella. Little to report on the bird front except for nine Mediterranean Gulls and two juvenile Yellow-legged Gulls on the beach and four Common Sandpipers and a Whimbrel passing over after dark. Three Porpoises were feeding offshore in the evening. An evening search for orthoptera produced eight nymphal Sickle-bearing Bush-crickets and a Tree Cricket nymph. A Common Toad was also found. A still start again today, with the wind gradually picking up throughout the day. A look at the Patch this morning produced five Mediterranean Gulls, nine Gannets and a single Arctic Skua which was busy harassing the terns feeding near the Patch. Two Ringed Plovers were moving along the beach and a single juvenile Yellow-legged Gull was also present near the Sea Watch Hide. Elsewhere throughout the day a few migrants were starting to appear, a single Common Sandpiper was present at the Long Pits. A Whimbrel flew over the Desert. A single Yellow Wagtail and Sand Martin flew over the trapping area. A single Porpoise was seen this morning by the Patch. A torchlight search this evening produced five Sickle-bearing Bush-cricket nymphs, which were all sitting prominently on the tops of the ragwort. Elsewhere, three Wood Sandpipers, three Little Stints and a Curlew Sandpiper were present on ARC Pit at the RSPB Reserve. A cloudy start to the day but warming rapidly by mid-morning becoming another warm, still day. A single Green Sandpiper flew south over the trapping area this morning. The Patch had very few large gulls present. The only notable species were four Mediterranean Gulls, three adults and one juvenile and nine Common Terns. Three Grey Herons were seen flying north along the coast this evening. Elsewhere, three Wood Sandpipers were present on the RSPB Reserve, with two present on Burrow's and a single bird on ARC. Another warm and clear day, although sunrise brought a gentle westerly breeze which continued throughout the day. Birds were again few and far between, with an hours afternoon sea watching at the fishing boats only producing a single Gannet, nine Mediterranean Gulls, one Kittiwake and a few Common Terns and Sandwich Terns, which were busy feeding along the colour change. Two Porpoise were also feeding offshore. Elsewhere, two Wood Sandpipers were seen on Burrow's Pit at the RSPB Reserve. An extremely warm and windless start to the day, although with very few notable birds. A few small mixed flocks of Swallows and Sand Martins were the only obvious migrants moving south. On the sea, eight Common Scoter flew west and two Gannets slowly drifted east. The Patch was largely empty of gulls and terns this afternoon while the beach was largely filled with fishermen. A single Grey Seal was seen up near the Lifeboat Station. Elsewhere, a Wood Sandpiper was present on ARC pit this evening. An overcast but still start this morning, with very few birds in the area. 24 Swifts flew south over the Trapping Area first thing and a Curlew could be heard flying west towards the RSPB Reserve. Five Mediterranean Gulls were present at the Patch, along with a single juvenile Yellow-legged Gull. Elsewhere, a Wood Sandpiper was present on Burrow's at the RSPB Reserve. A quiet day bird wise, except for gulls at the Patch this morning. A total of 15 adult and two juvenile Mediterranean Gulls were present on the beach. A single juvenile Yellow-legged Gull was also feeding close to the boil with 15 Common Terns and a few Sandwich Terns. Around the Moat there was lots of butterfly activity. Small Skipper, Essex Skipper, Meadow Brown, Gatekeeper and Marbled White were in plentiful numbers along with a few Brown Argus, Common Blue and Small Copper, including one female individual of the fascination var radiata. Another good day for Mediterranean Gulls with 16 present around the recording area. 12 adults and two juveniles were present at the Patch this morning along with a single juvenile Yellow-legged Gull. The numbers of gulls has slowly been building. A Redshank flew over the Point. Four Swifts flew north and six Sand Martins flew south. A single Grey Seal was seen by the Patch this morning. A single Terrapin of unknown species was seen in the top Long Pit this afternoon. The first Migrant Hawker Aeshna mixta of the year was seen by the Old Lighthouse this morning. 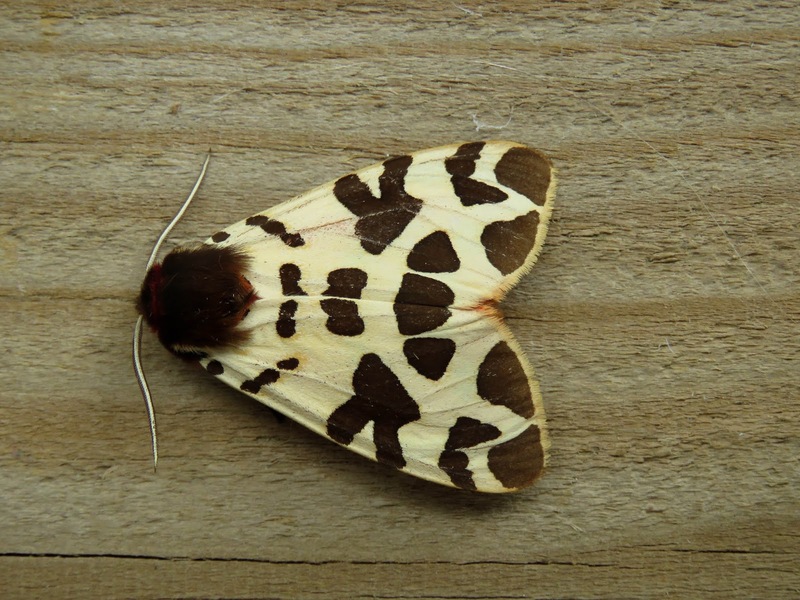 The moth trap has continued to be busy during this extended period of still, warm weather. 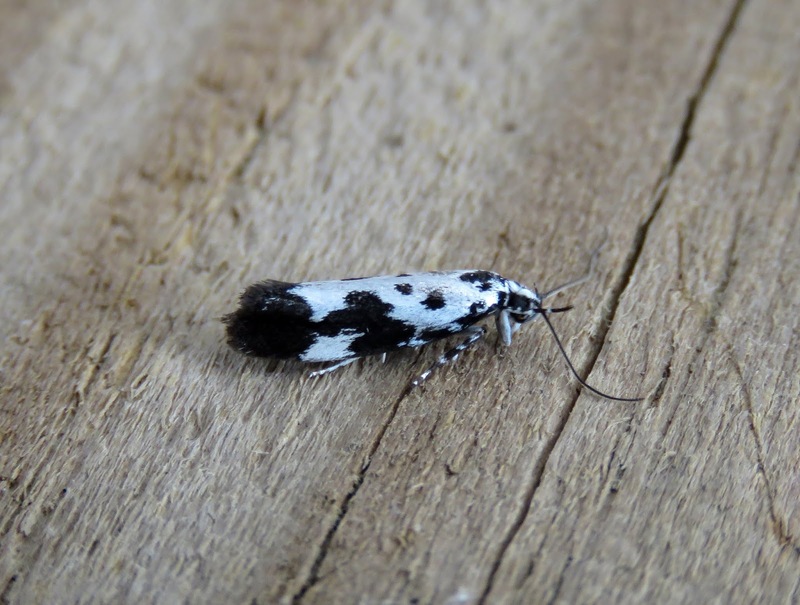 44 species of macro moth were trapped including Six Sussex Emerald, one Kent Black Arches and two Plumed Fanfoot. 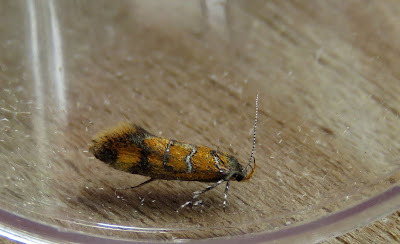 45 species of micro moth were in the trap including two Anerastia lotella, a Metzneria aestivella, two Ethmia bipunctella, and five Cynaeda dentalis. The Patch is steadily getting busier as the month progresses. 16 Mediterranean Gulls including several juveniles were present on the beach this morning. Three Yellow-legged Gulls, one adult and two juveniles were also present. Five Grey Herons came in off the sea and headed towards the Lydd Ranges. A Grey Wagtail flew west along the beach by the Power Station and a Yellow Wagtail was seen at the Top of the Long Pits. Four Harbour Porpoise and two Grey Seals were seen at the fishing boats this afternoon. The moth trap was quieter this morning but held six Sussex Emerald, a particularly high count for the observatory moth trap. Two Small Red-eyed Damselflies were seen at the southern end of the Long Pits. There was a juvenile Yellow-legged Gull and 12 Mediterranean Gulls, nine adults and three juveniles, at the Patch early this morning feeding with 500 Black-headed Gulls, six Common Terns and four Sandwich Terns. Two Sand Martins were seen flying south towards the fishing boats. A Garden Warbler was singing in the trapping area and a male Black Redstart was frequenting a private house on the estate. Six Porpoise were seen off the board walk along with a Thresher Shark, which breached twice beyond the Buoy early this morning. At the top of the Long Pits two Brown Hawkers were hawking over the pit and a several fresh Common Blues were on the wing. Another relatively warm, still day. 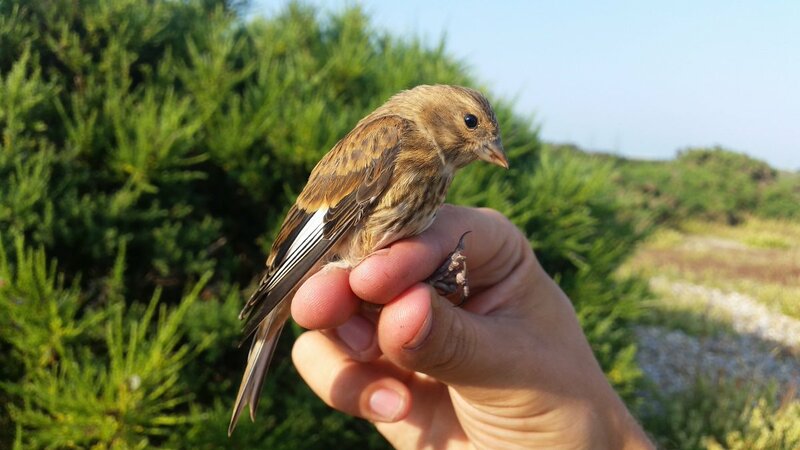 An early morning ringing session in the desert produced a Linnet and a Reed Bunting among more regularly encountered species. Two Oystercatchers, a Lapwing and four Swifts passed overhead. A Great Spotted Woodpecker was also making its way along the telegraph poles towards the fishing boats, the first in the area since the spring. An evening sea watch at the Patch produced two Gannets, three Mediterranean Gulls, 30 Sandwich Terns and 15 Common Terns. 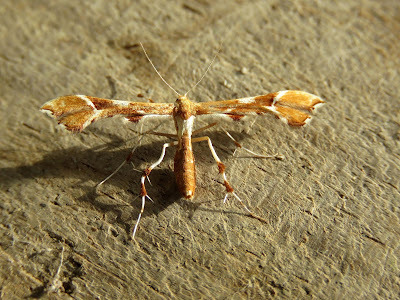 The moth trap was very busy last night with 34 species of Macro Moths and 49 species of Micro Moth. 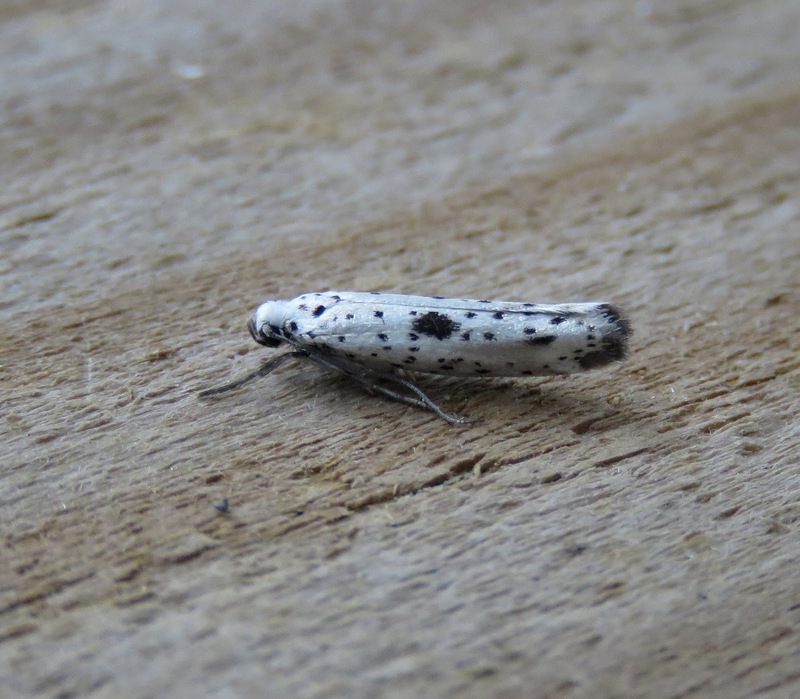 Notable species included hundreds of Synaphe punctalis, two Sussex Emeralds, nine Kent Black Arches Meganola albula and 11 Cynaeda dentalis. Another quiet day at the point. Thick fog rolling in first thing this morning but gradually cleared. An evening check of the Patch only produced a single Mediterranean Gull with 300 Black-headed Gulls and 15 Common Terns. Further out to sea a flock of 40 Common Scoter flew east. A quiet day on the bird front. The only notable species were four Mediterranean Gulls which were feeding at the Patch this afternoon along with 600 Black-headed Gulls, 25 Common Terns and 20 Sandwich Terns. The moth trap was also quiet but managed to produce a single Sussex Emerald. The first juvenile Yellow-legged Gull and Mediterranean Gull arrived at the Patch but it was otherwise a quiet day. A Grey Seal and a Porpoise were feeding offshore. 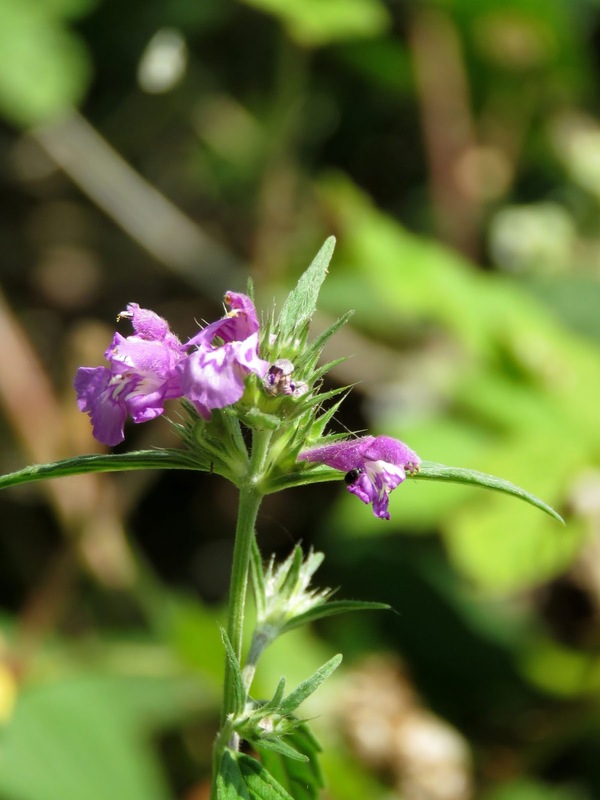 Lots of butterflies can be seen in the area with the first of a new brood of Brown Argus appearing and a few Essex Skippers among the hoards of Small Skippers. Large numbers of Large Whites were also seen. 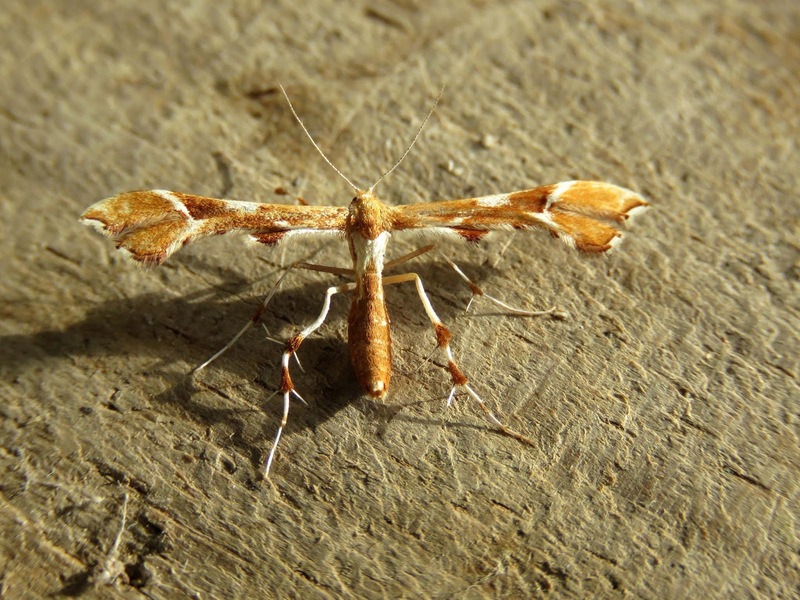 A Green Sandpiper flew over the Observatory in the early hours of the morning and a Mediterranean Gull was also seen. A Black-neck Moth was trapped overnight which is a surprisingly scarce species at the Observatory. Another hot and sunny day but already some signs of autumn migration with 31 Sand Martins moving south and out to sea. An adult Mediterranean Gull was feeding at the Patch. An improvement in the moth trapping produced 20 Diamond-backed Moths, a single Sussex Emerald and this Privet Hawk-moth. One Common Emerald damselfly was found at the Long Pits. 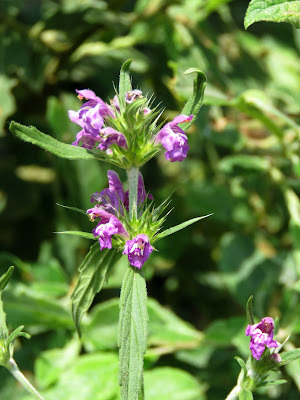 The vegetation is now starting to look very dry but the nationally scarce Red Hemp-nettle is now flowering well.